I found out recently that my husband is a big fan of shepherd's pie. I suppose the subject never really came up before because when I met him, I was a long time vegetarian. The occasion for the conversation was a take-out meal from a vegan restaurant that had a version of shepherd's pie on the menu. 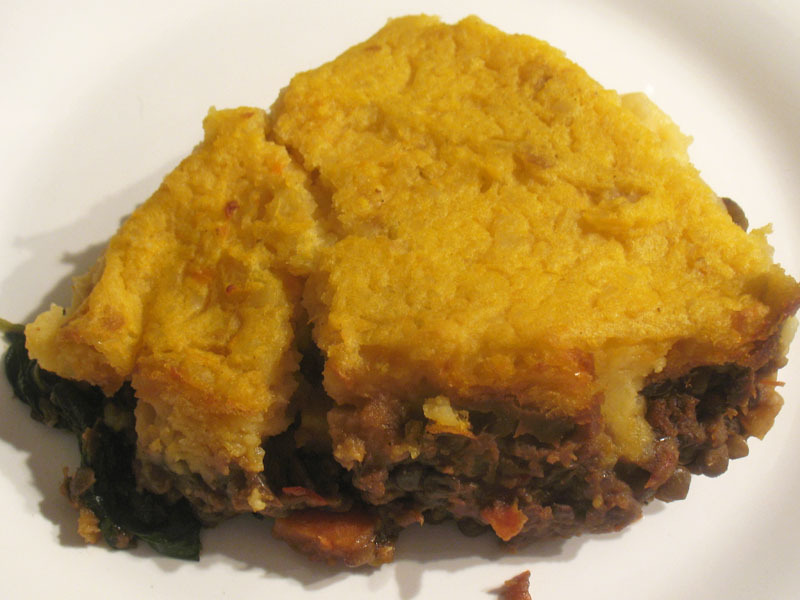 Traditionally, shepherd's pie is neither vegetarian nor vegan. Technically not a pie as there is no pastry involved, it's more like a casserole. The usual components are a ground meat base, such as beef or lamb, with vegetables and a topping of mashed potatoes. It's inexpensive to make and one that many remember from their childhood as classic comfort food. 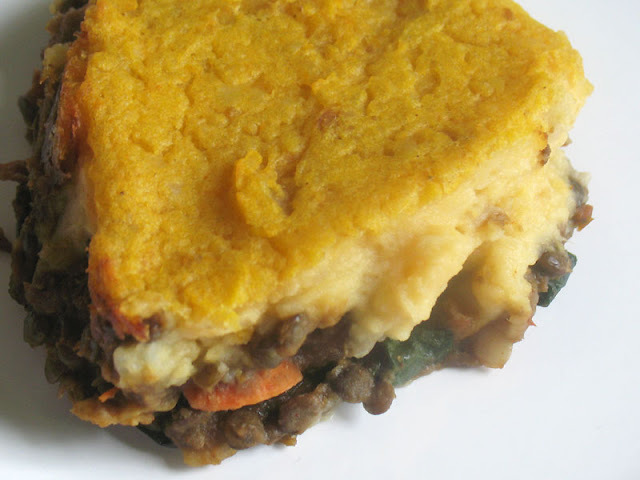 There are endless ways to prepare shepherd's pie, and after trying the vegan version from the restaurant, I decided I was going to come up with a vegetarian variation of this classic that also happens to be vegan. The one we ordered was just too bland for my liking. For extra flavor and flair, and to suit my tastes, I decided to curry it up and decided upon Puy lentils, carrots, parsnips, tomato and spinach as the base of the dish. 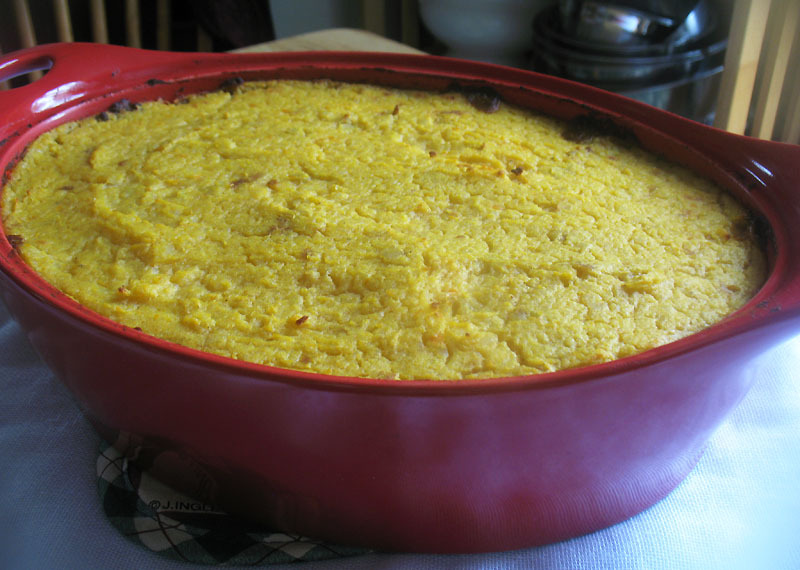 I topped it with mashed potato and sweet potato. Because I have never made shepherd's pie before, I wasn't sure how it would turn out but I'm delighted to report it was even better than expected. The consistency of the base was just right — succulent and moist without too much of a liquid component, with some pleasant spicing — all tucked under a nicely browned potato crust. Served with a garam masala spiced portobello sauce thickened to the consistency of a gravy, this meal was pure comfort indeed, especially alongside some homemade biscuits. And my husband's verdict? It was the tastiest shepherd's pie he'd ever eaten! 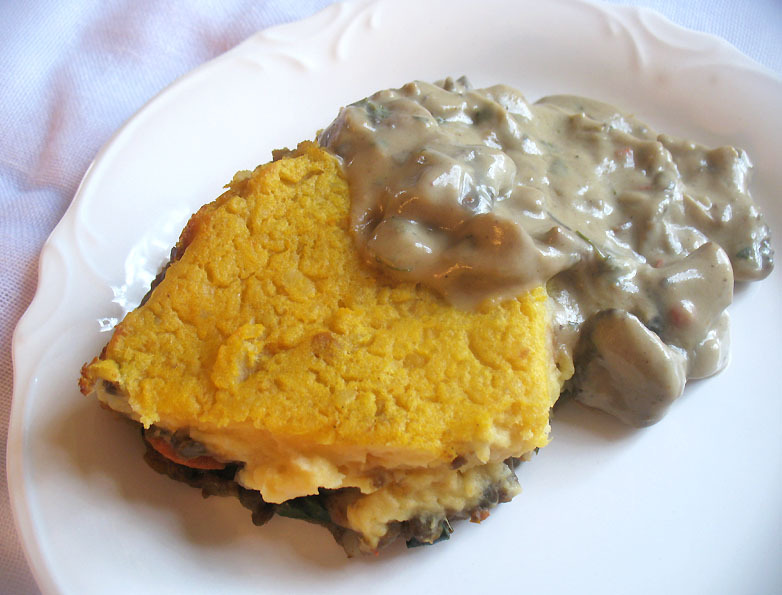 Notes: If I wasn't serving the casserole with mushroom sauce, I would have included some mushrooms as part of the bottom layer for the meaty texture they contribute. This pie can be spiced up or seasoned in any number of ways. It's a fun dish to experiment with. Pierce the potatoes and sweet potato with a fork and bake in a 425° oven for 45 minutes or until fork tender. Set aside to cool, remove the skins, and transfer to a large bowl. (Alternately, you can peel and chop the potatoes and sweet potato and boil until fork tender.) Mash with the coconut milk and salt and pepper. Whip the potatoes with an electric beater, adding more milk as necessary, until light and fluffy. Set aside. Meanwhile, soak the sun-dried tomatoes in hot water for 30 minutes. Separately, soak the dried mushrooms in 1 cup of hot water for 30 minutes. Drain the sun-dried tomatoes, chop, and set aside. Drain the mushrooms and reserve the soaking water. Rinse the lentils and transfer to a medium saucepan and add 2 cups of water, the turmeric and bay leaf. Bring to a boil, reduce the heat to low, cover, and simmer until the lentils are soft and the water is mostly evaporated. Add more water during the cooking process if necessary. Meanwhile prepare the sauce. Heat the oil in medium saucepan over medium heat. When hot, add the shallots or onion and sauté for 4 to 5 minutes until soft. Stir in the chilies and flour and cook for another few minutes, stirring constantly. Add the dried and fresh mushrooms to the pan, along with the coconut milk, reserved mushroom soaking liquid, water, spices and salt. Bring to a gentle boil, reduce the heat to medium-low and simmer, uncovered, until thickened — about 15 minutes. Stir in the fenugreek leaves and simmer for another few minutes. Now make the pie. Heat the oil in a large saucepan over medium heat. When hot, add the onion to the pan and sauté until soften - about 5 minutes. Stir in the carrots and parsnip and cook for another 8 minutes or until the vegetables are tender. Add the ground spices and chilies to the pan, stir for a minute, and then add the red wine, stock or water to deglaze. Stir until the liquid has evaporated. Add the tomatoes to the pan and simmer for another few minutes. Add the spinach a few handfuls at a time until wilted. If using peas, stir them in now and simmer for another few minutes, stirring often. Stir in the lentils and simmer for another few minutes until thickened but not dry. Season with some salt and pepper. Transfer the vegetable and lentil mixture to a lightly greased casserole dish. Spread the mashed potatoes evenly over top. Bake in a 400° oven for 20 to 30 minutes until the top begins to brown. Place under the broiler for a few minutes to further brown the potatoes. Let stand for 10 minutes. Serve hot or warm with a ladle or two of mushroom sauce. Never made a shepherd pie myself, this looks very filling!